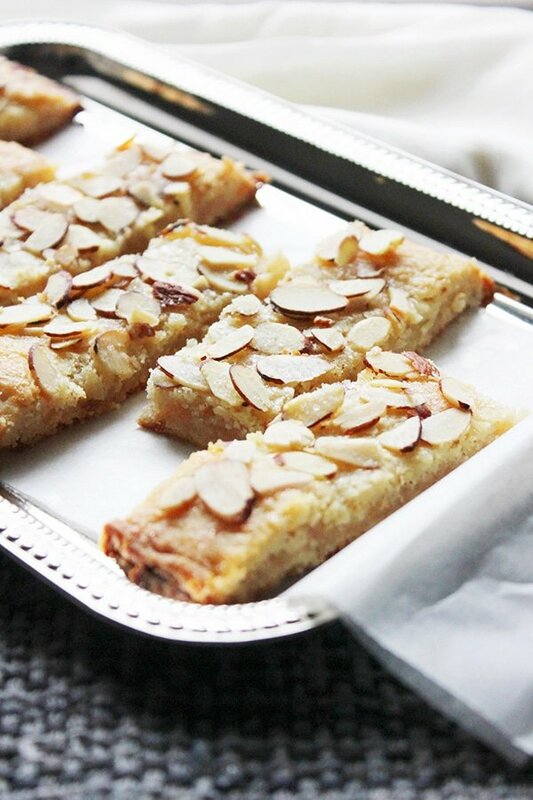 Luqaimat – لقيمات- is a well-known dessert between Arabs. Egyptians, Lebanese, Syrian, and Jordanians call it Luqmat al Kadhi – لقمة القاضي– and they make it in a complete different way than Gulf countries, although they all look the same. Some recipes ask for yogurt, others for baking powder and milk, Arabian Gulf countries use flour, dry yeast, saffron, and cardamom only. The dumplings are not sweet, therefore, honey, regular syrup, or date syrup must be poured on top of the dumplings. 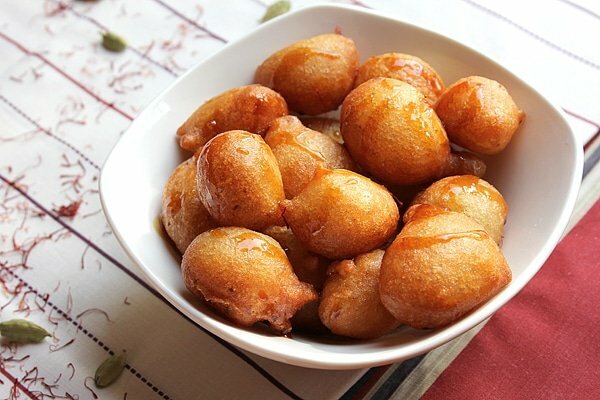 Luqaimat, are usually made in the month of Ramadan and enjoyed after iftar. If the previous sentence didn’t make sense to you, then you should know that Ramadan is a holy month for Muslims. Muslims fast in this month, they stop eating and drinking from dawn to sunset. Iftar means breaking the fast. The recipe I’m sharing today is for dumplings made in the Arabian Gulf area. They are crunchy from out side and soft from inside. Making these dumplings require focus. Don’t misunderstand me, they are so easy to make, but to get good dumplings you have to fry them the right way. If the oil is too hot, they’ll only cook from the outside, if the oil is not hot enough the dumplings will absorb it, and you won’t enjoy them as much. I will teach you how to fry good dumplings, and share the secret of making them crunchy! – Add saffron and cardamom to 1/4 cup warm water. Keep aside. – Sift flour with salt and keep aside. – In 3/4 cup warm water, add sugar and yeast. Keep aside for 5 minutes. – To the flour add the mashed potato, saffron, and cardamom mixture, and stir. – Leave the batter to double in size, may take 30 to 40 minutes. The batter now should have bubbles, and be somewhat bouncy. – Heat oil. Take around a teaspoon from the batter, and carefully drop it in the oil, if it floats quickly, the oil is too hot. 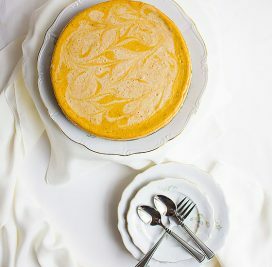 – Scoop the batter with your fingers (take around 1/2 tablespoon from batter), use your thump to push the batter off your fingers and in the oil, or take 1/2 tablespoon from batter using a spoon and push the batter off it using another spoon. 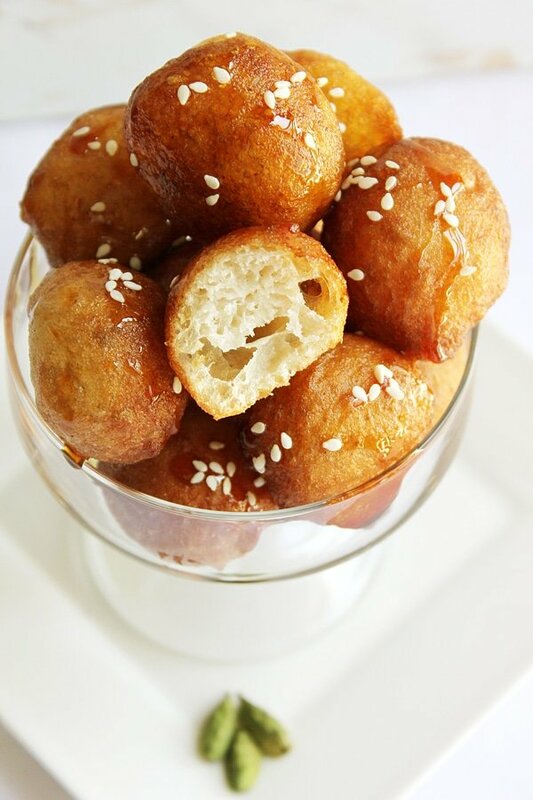 – After 1 minute of frying, move the dumplings around using a wooden spoon or spatula, this will make them cook evenly. – When the dumplings are light brown, remove them from oil, and place them on kitchen paper. – Pour your favorite syrup on top. The syrup should be at room temperature. * If your dumplings looked like aliens, don’t be discouraged, keep on trying and you’ll eventually have round ones. My first dumplings had the shape of hands and feet, now that’s weird! Where I grow up we have very similar pastry. These are just perfect and incredibly tasty looking, Muna! Thank you for sharing and have an amazing week ahead! A delicious treat! Those flavors are just heavenly. Thanks Rosa, I try to bring in some delightful dishes, from different parts of the world, so we all enjoy the versatile flavors! This is simply mouthwatering, Muna! Hope I can grab some right now! That looks so fluffy and the glaze on top is stunning! These look picture-perfect; my grandmother who was Lebanese and had never left the country, would make these for the fest of Epiphany, in January; hers were also made with potato and were tiny, like marbles; I wish I could make mine like hers! Thanks for sharing Muna, I tasted some about 8 years ago at a mid eastern gathering and since then been looking for the recipe. Now I know the name and how to make it. In Malaysia we have similar dumplings using baking soda instead. We have a variation of using bananas called kueh cucur or cocodok. But the taste of luqaimat is awesome! I can make a small batch and cook them in a waffle maker without using so much oil. It would be perfect, if you also tell us about the calories in it. Hi Muna! I have made these a lot before I see this recipe and they come up very good once came out doughy from inside and crunchy from outside and now I know why thx! and also you don’t have to put mashed potatoes it just makes it crunchy like how you said but thx for the secret and How many dumplings will this recipe have! Please I need it by today thanks! I just wanted to ask about this recipe. I am very new to cooking, and these have to be my favourite desert. My aunt makes them, but now that I’m abroad, I feel deprived and would like to give this a go myself. What do you mean by mashed potato? Do I just mash a potato, or actually make the dish (butter and all), mix that in. Please confirm! can I use instant yeast instead of dry. Please share which brands you use for yeast. I have lots of trouble finding one. I prefer using Alali instant yeast. Hi Leena, of course you can use instant yeast, I use it all the time and it works the same. I use Saf Instant yeast. can I bake these luqaimat. 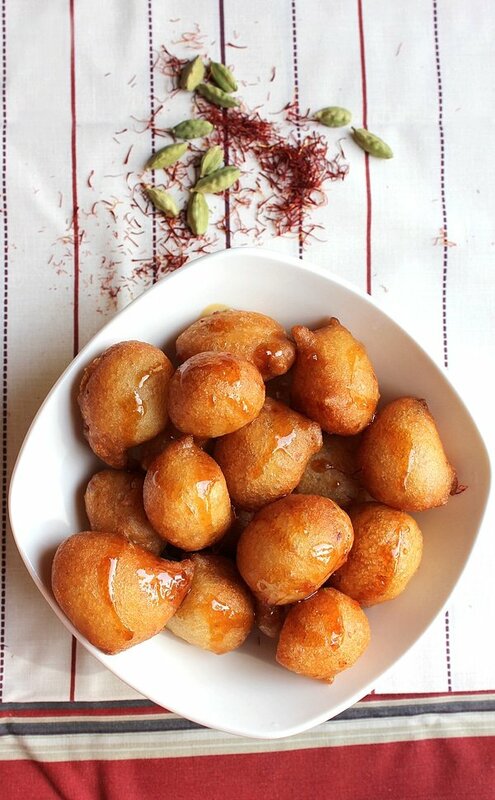 can you please share a receipe for baking these luqaimat? I’m sorry Luqaimat can not be baked! Good Gods, these look GOOD! them and offer some to them. Thanks for the Rx! These are mostly served in the Month of Ramadan and is very popular, hope you enjoy the recipe.